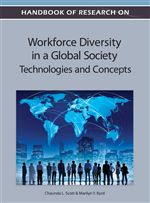 This chapter will include a brief description of the history of diversity; advantages of being culturally competent; paradigms/perspectives of diversity management; and a summary of the business case for diversity. In addition, theories and models of organization development and change management are further explained as a way to understand the organizational context surrounding diversity interventions. Cox (2001) defines “diversity as the variation of social and cultural identities among people existing together in a defined employment or market setting” (p. 3). Cox and Smolinski (1994) define diversity as “the representation of people of different group identities in the same organization social system”(p. 12). Generally defined, “diversity is multidimensional, but the key to diversity is the valuing and managing of differences in such a way that the results lead to inclusion”(Plummer, 2003, p. 10). The term diversity refers to the presence of a wide variety of cultures, ethnic groups, languages, physical features, socio-economic backgrounds, opinions, religious beliefs, gender identity, and neurology within a one population. Diversity, in this study, will be defined as it is above, but within an organizational context. When organizational leaders became aware of the demographic changes in the workforce and consumer base, it became apparent that a focus on organizational diversity was critical. As a result of legislation mandating Equal Employment Opportunity and Affirmative Action, leaders and managers began to examine the employment demographics within their own companies (Plummer, 2003). Within an organizational framework, diversity refers to “making use of and leveraging human differences toward organizational effectiveness and productive business goals” that maintain a high performing workforce (p. 13). A potential benefit of diversity will be “to promote organizational effectiveness in creativity, marketing, problem-solving, and quality of decision-making by being conscious of individual identities” (Cox, 1993, p. 251). When identifying individual diversity, it is suggested one distinguishes between the primary and secondary dimensions. Loden and Rosener (1991) defined “primary dimensions of diversity as those immutable human differences that are inborn and/or that exert an important impact on our early socialization and ongoing impact throughout our lives” (p. 18) such as age, ethnicity, gender, physical abilities/qualities, race, and sexual orientation. Secondary dimensions contain elements of control and are things that can be changed such as: educational background, geographic location, income, marital status, military experience, parental status, religious belief and work experience. Both are extremely important because they influence people’s identity, how they define themselves in the world, and how others react to them (1991). Figure 1 shows both primary and secondary dimensions of diversity. The inner circle represents the primary dimensions and the outer circle represents the secondary dimensions. Change: Implies movement toward a goal, an idealized state, or a vision of what should be and movement away from present conditions, beliefs, or attitudes. Organizational Cultural Competence: The capacity to function effectively with all cultures and to make creative use of a diverse workforce in a way that meets business goals and enhances performance. Diversity: Differences among people with respect to age, class, ethnicity, gender, health, physical and mental ability, race, sexual orientation, religion, stature, education level, job level and function, personality trait, and other human differences. Corporate Culture: Basic assumptions and beliefs that are shared by members of an organization, that operates unconsciously, and that is defined in a basic “taken-for-granted” fashion an organization’s view of itself and its environment. These assumptions and beliefs are learned responses to a group’s problems. They come to be taken for granted because they solve those problems repeatedly and reliably. Diversity Management: Uses applied behavioral science methods, research and theory to manage organizational change and stability processes, that support diversity in organizations and eliminate oppression based on race, gender, sexual orientation, and other human differences, in order to improve the health and effectiveness of organizations while affirming the values of respect for human differences, social justice, participations, community, authenticity, compassion, protection and humility, effectiveness and health, and lifelong learning. Cultural Competence: The capacity to function effectively with all cultures and to successfully navigate a multicultural society. Leveraging Diversity: Enhancing organizational effectiveness and performances by making use of the different perspectives, experiences, and abilities that people bring to the workplace. Cultural Diversity: The inclusion and acceptance of the unique worldviews, customs, norms, patterns of behavior, and traditions of many groups of people.